Linus Torvalds has released the 4.9 Linux kernel yesterday, as was expected. With 16214 non-merge commits, this is by far the busiest kernel development cycle ever, but in large part due to the merging of thousands of commits to add support for Greybus. LWN has very well summarized what’s new in this kernel release: 4.9 Merge window part 1, 4.9 Merge window part 2, The end of the 4.9 merge window. Bootlin engineer Boris Brezillon, already a maintainer of the Linux kernel NAND subsystem, becomes a co-maintainer of the overall MTD subsystem. Contribution of an input ADC resistor ladder driver, written by Alexandre Belloni. As explained in the commit log: common way of multiplexing buttons on a single input in cheap devices is to use a resistor ladder on an ADC. This driver supports that configuration by polling an ADC channel provided by IIO. On Atmel platforms, improvements to clock handling, bug fix in the Atmel HLCDC display controller driver. Support for the PIC interrupt controller, used on the Marvell Armada 7K/8K SoCs, currently used for the PMU (Performance Monitoring Unit). By Thomas Petazzoni. Enabling of Armada 8K devices, with support for the slave CP110 and the first Armada 8040 development board. By Thomas Petazzoni. Addition of GPIO support to the AXP209 driver, which is used to control the PMIC used on most Allwinner designs. Done by Maxime Ripard. The improved sunxi-ng clock code, introduced in Linux 4.8, is now used for Allwinner A23 and A33. Done by Maxime Ripard. Add support for the Allwinner A33 display controller, by re-using and extending the existing sun4i DRM/KMS driver. Done by Maxime Ripard. Addition of bridge support in the sun4i DRM/KMS driver, as well as the code for a RGB to VGA bridge, used by the C.H.I.P VGA expansion board. By Maxime Ripard. 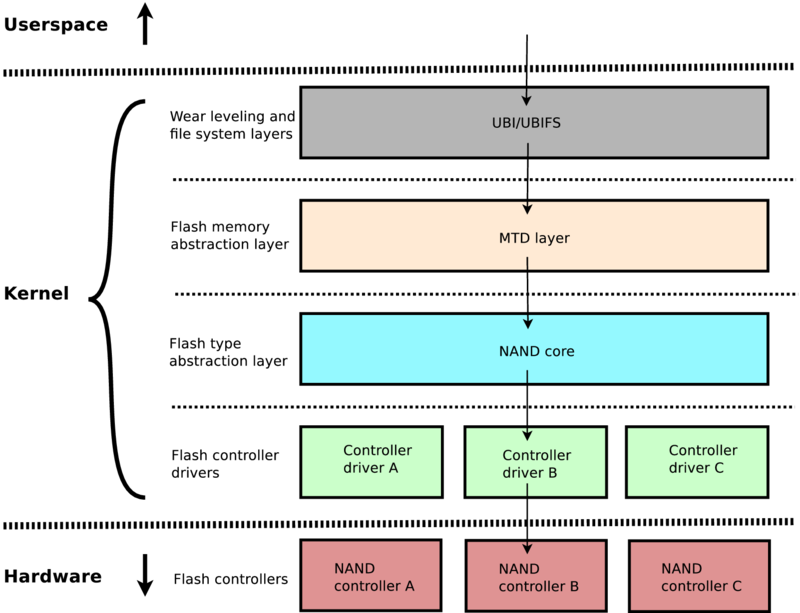 Numerous cleanups and improvements commits in the UBI subsystem, in preparation for merging the support for Multi-Level Cells NAND, from Boris Brezillon. Addition of mtd_pairing_scheme, a mechanism which allows to express the pairing of NAND pages in Multi-Level Cells NANDs. 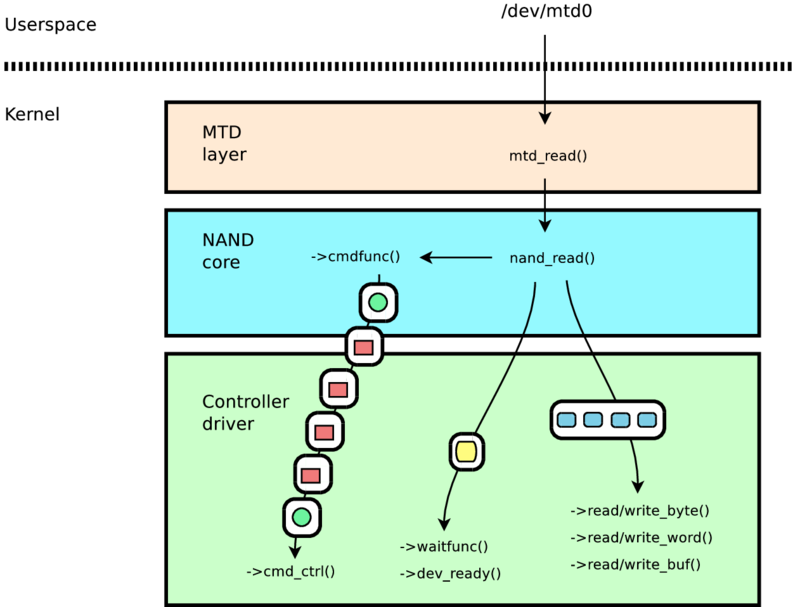 Improvements in the selection of NAND timings. Maxime Ripard, as the Allwinner co-maintainer, merged 78 patches from other developers. Grégory Clement, as the Marvell EBU co-maintainer, merged 43 patches from other developers. Alexandre Belloni, as the RTC maintainer and Atmel co-maintainer, merged 26 patches from other developers. Boris Brezillon, as the MTD NAND maintainer, merged 24 patches from other developers. 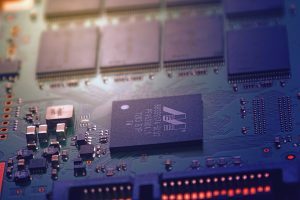 Bootlin engineer Boris Brezillon has been involved in the support for NAND flashes in the Linux kernel for quite some time. 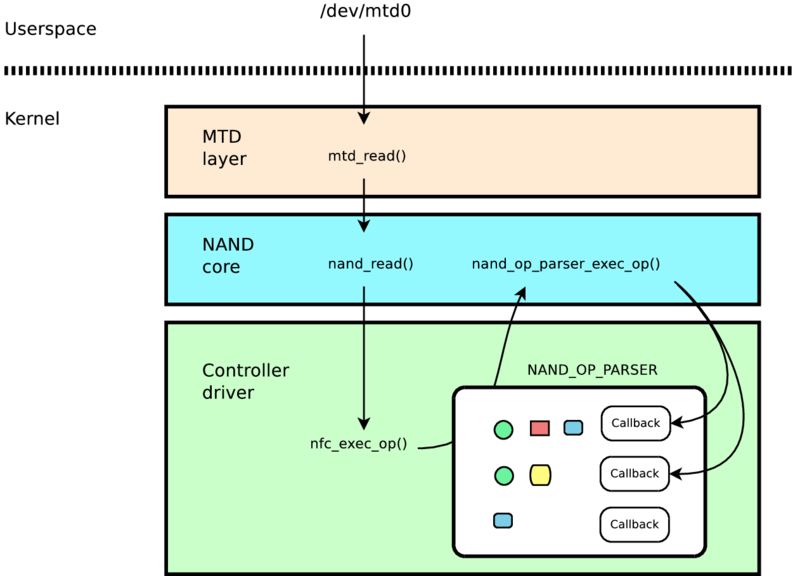 He is the author of the NAND driver for the Allwinner ARM processors, did several improvements to the NAND GPMI controller driver, has initiated a significant rework of the NAND subsystem, and is working on supporting MLC NANDs. Boris is also very active on the linux-mtd mailing list by reviewing patches from others, and making suggestions. For those reasons, Boris was recently appointed by the MTD maintainer Brian Norris as a new maintainer of the NAND subsystem. NAND is considered a sub-subsystem of the MTD subsystem, and as such, Boris will be sending pull requests to Brian, who in turn is sending pull requests to Linus Torvalds. See this commit for the addition of Boris as a NAND maintainer in the MAINTAINERS file. Boris will therefore be in charge of reviewing and merging all the patches touching drivers/mtd/nand/, which consist mainly of NAND drivers. 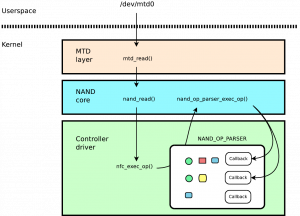 Boris has created a nand/next branch on Github, where he has already merged a number of patches that will be pushed to Brian Norris during the 4.7 merge window. We are happy to see one of our engineers taking another position as a maintainer in the kernel community. Maxime Ripard was already a co-maintainer of the Allwinner ARM platform support, Alexandre Belloni a co-maintainer of the RTC subsystem and Atmel ARM platform support, Grégory Clement a co-maintainer of the Marvell EBU platform support, and Antoine Ténart a co-maintainer of the Annapurna Labs platform support.